My neighbors have been busy these last few days. Christmas decorations abound all around me. But wait, are we even ready for a journey to the manger? It is easy to rush ahead to the secularized Christmas that surrounds us in our neighborhoods, stores and media. But we are called to a different way. The season of Advent is one of watchful waiting set in the reality of our lives. It calls us to believe that the promises of God are certain even if we have trouble imagining a kingdom of peace and light coming to being. It asks of us faithfulness and hope no matter what. Right now OSH is in transition and no one of you knows what this time will ask of you, no one knows exactly what your future looks like. What you are asked to do is journey together faithfully in expectation of the new future that lies before you. So take this time in Advent to be still, prepare your hearts to watch and wait. Trust that God is still with you as you continue to follow after his Son. The Christmas Boutique is this Saturday, December 1st, from 10 am – 3 pm --Baked goods are needed. Also, I am told that a true treat is waiting for you so come and bring friends and neighbors. During the Advent season we celebrate leadership; past present and future through this church wide offering. Each of us has been influenced at some point in our faith journey by pastors who have led our congregations. Your contributions help to support current and retired church workers in need through income supplements, housing supplements and emergency grants. It also serves to support our historic commitment to higher education at schools such as Menaul School in New Mexico, Presbyterian Pan American School in Texas and Stillman College in Alabama. Watch for more information in the coming weeks. This week we are blessed with a musical gift in memory of Pastor Tom. 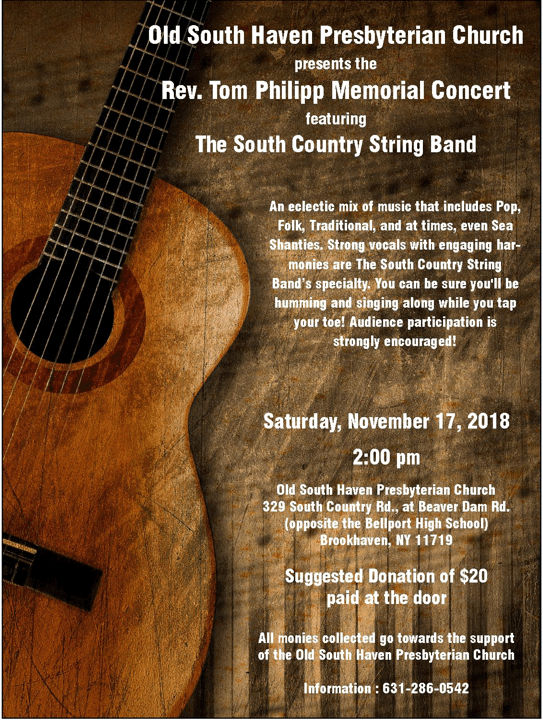 The South Country String Band will entertain us on Saturday, November 17th at 2 pm in the Chapel followed by a reception in the Carriage House. 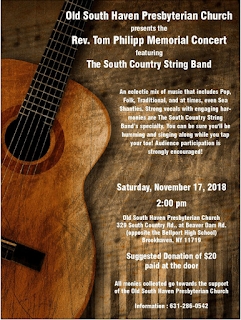 Thanks to the generosity of the band members all funds received will go to support the work and ministry of Old South Haven. It is a perfect opportunity for you to reach out and invite neighbors and friends to this afternoon of live music. Then on Sunday afternoon, November 18th at 4:30 pm, as we enter Thanksgiving week you are invited to come together for and ecumenical service of Thanksgiving at St. James Episcopal Church just down the road at 260 Beaver Dam Road. The service is sponsored by the South Country Clergy Group. You are encouraged to bring something to share at the fellowship hour following the service. Please remember those who are hungry next Sunday with your donation of non-perishable food or cash to support area food pantries. The most needed food items are shelf-stable milk, tuna, jelly, fruit (not pineapple as everybody seems to donate it), vegetables and as the weather cools hearty soups and stews. It is November and in most churches that means Stewardship season. While I am a firm believer that being a good steward is basic to our call to follow after Christ I have never really been a great fan of Stewardship Season, Stewardship Sunday or the Stewardship Sermon. Here's why. Being a good steward is fundamentally about building good relationships. Relationships with our planet, our neighbors, those in need, our community of faith—really everyone. You can't be a good steward part time. You also can't be a good steward is you hoard your time, your talents, and your resources. In the parable of the talents (Luke 19.11-27 and Matthew 25.14-30) Jesus describes three servants entrusted with their master's money. Two of them invest and increase the funds they are charged with. But the third is afraid and buries the money to keep it safe. Who do you think the master praises? The two who took a risk and reaped rewards. We need to think of our stewardship of what God has given us not as something to be parsimonious with but rather something we are willing to risk day in and day out. Because this is how to bring the good news to a world that is in need of hope, generosity and peace. Adult Book Study—The Faith Club: A Muslim, a Christian, a Jew—Three Women Search for Understanding Discussion this afternoon at 4pm. Even if you didn't read the book please join us for what is sure to be a lively discussion. Ecumenical Thanksgiving Service—The South Country Clergy are sponsoring a service on Sunday, November 18th at 4:30 pm at St. James Episcopal Church (260 Beaver Dam Road, Brookhaven). Please bring something to share at the fellowship time following the service.